It is a tradition to visit a shrine or temple during the New Year in Japan. 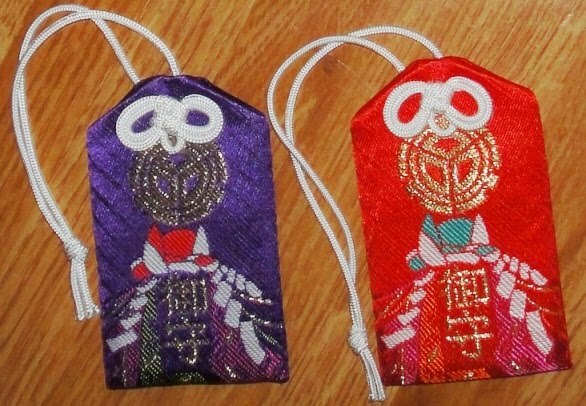 This first trip to a shrine or temple is known as hatsumode. 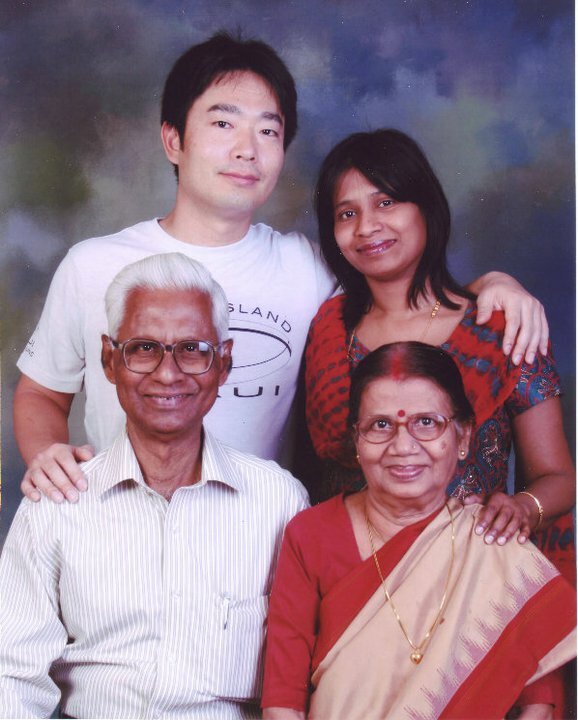 This year, hubby and I were unable to visit a shrine during the New Year holidays as we had been to India that time. 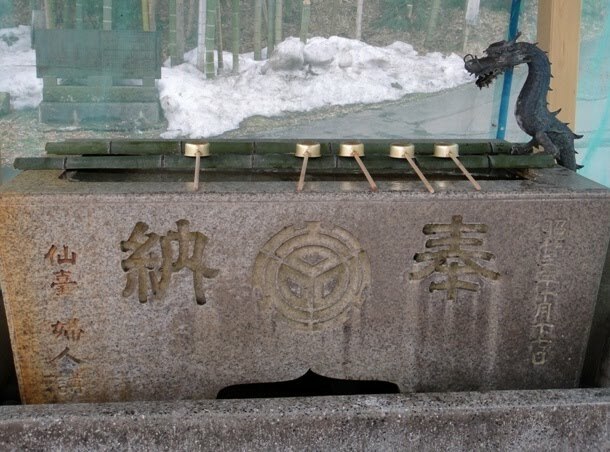 After almost two months, on February 27th, we visited a shrine named Taiheizan Miyoshi Jinja in Akita city. Taiheizan Miyoshi Jinja (shrine) was established in 673 AD. 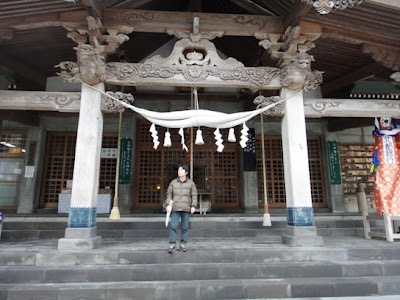 At this shrine people pray for success in business, family prosperity, and winning in life. 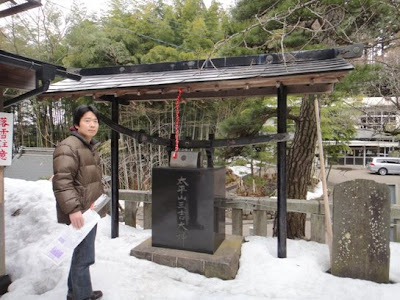 During Edo period, Satake samurai clan of Akita domain (also known as Kubota domain) regularly prayed at this shrine. 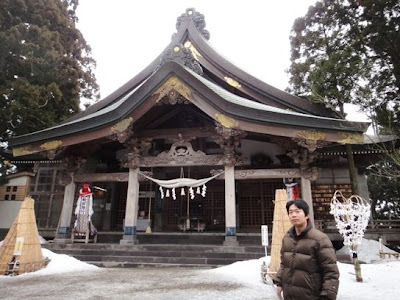 Now also this shrine is very popular among the people of Akita and about 800000 people visit the shrine every year. 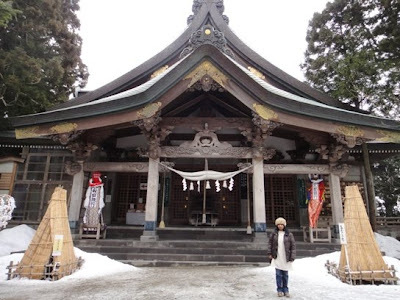 Miyoshi Jinja was originally constructed at the top of Mount Taihei which is 1171 meters above sea level. 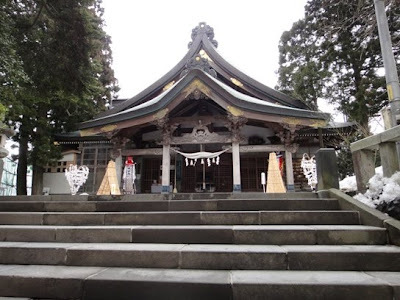 This remote shrine is known as Okumiya, which is difficult to visit and in the past women were forbidden to enter this shrine precinct. Therefore, a village shrine named Satomiya was established which is located near human habitation at the foot of the mountain where everyone is free to go and worship. Satomiya Taiheizan Miyoshi Jinja allows for more convenient worship of the god originally enshrined in Okumiya at higher mountains. Satomiya shrine was constructed in 1977 and the shrine headquarters is now located at this premises. 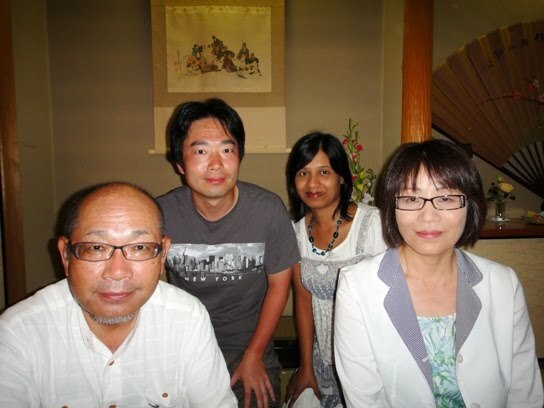 Hubby and I visited Satomiya shrine. We reached Taiheizan Miyoshi Jinja at about 1 pm. A gate named seisando torii was located at the entrance of the shrine precinct. 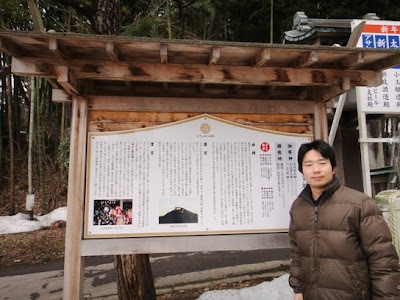 Near the torii gate, there was an information notice board that gave historical information about the shrine. 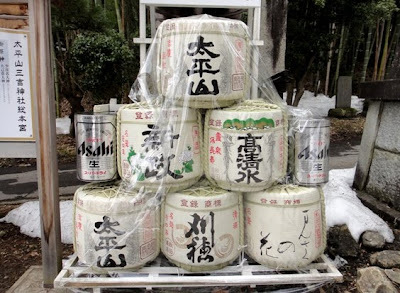 Near the entrance we saw several huge barrels of sake offerings to the god of the shrine. At the torii gate we saw a pair of lion-dogs called komainu, which are lion-like creatures that guard the entrance of the shrine. 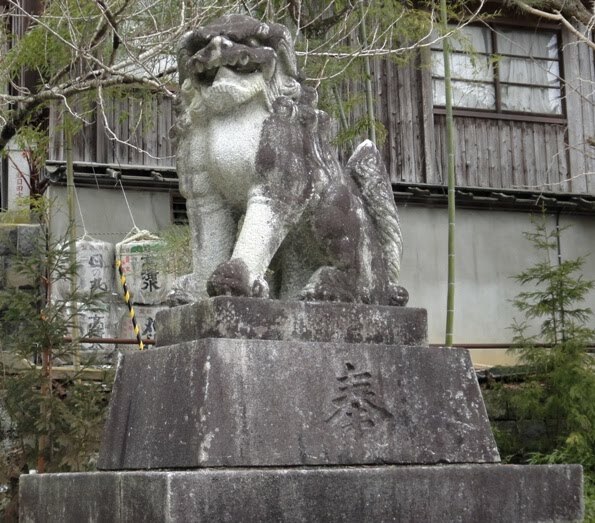 One of the komainu statues has its mouth open as if saying ‘ah’ which symbolizes opening or birth. The other komainu statue has its mouth closed as if saying ‘um’ which symbolizes closure or death. Komainu are supposed to protect the shrine from evil spirits. 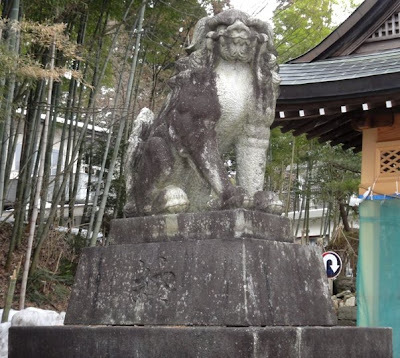 Komainu statues at this shrine were made of stone and located on either side of the entrance. Seisando torii gate looked old but it was an elegant structure. 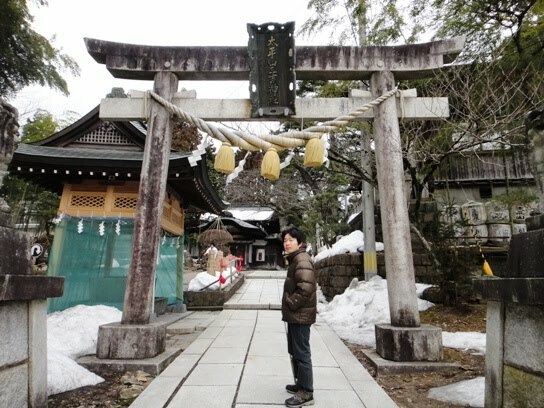 After entering the gate, on the left side there was a water house named temizusha where we washed our hands and rinsed our mouth before offering our prayers at the shrine. It is a symbolic act to clean the mind and body of impurity. The main altar of the shrine named goshaden looked so beautiful and exquisite. The current structure of the roof of this main altar building mimics the appearance of Mount Taihei. 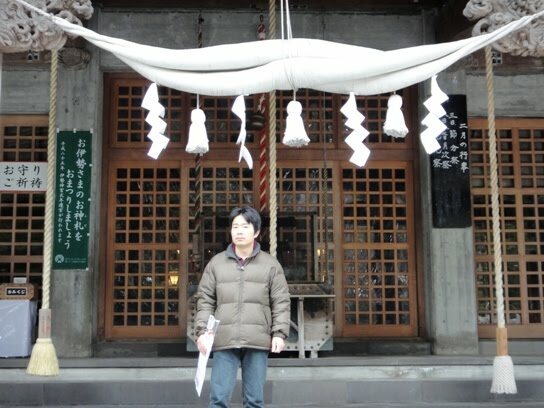 We loved the beautiful pattern of thick shimenawa hanging at the entrance of goshaden. 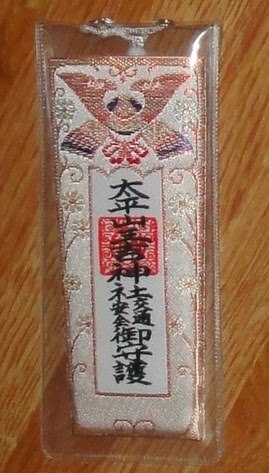 Shimenawa is braided rice straw rope used for ritual purification. We took several photos of goshaden building. 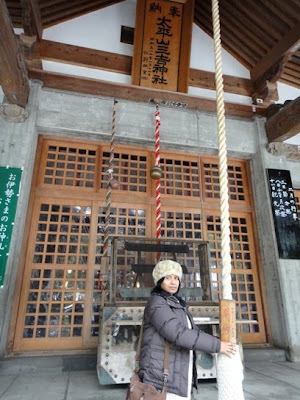 At the altar, we offered money into the offertory box, pulled the rope attached to the bell hanging from the rafter in front of the box, and then clapped our hands and prayed. 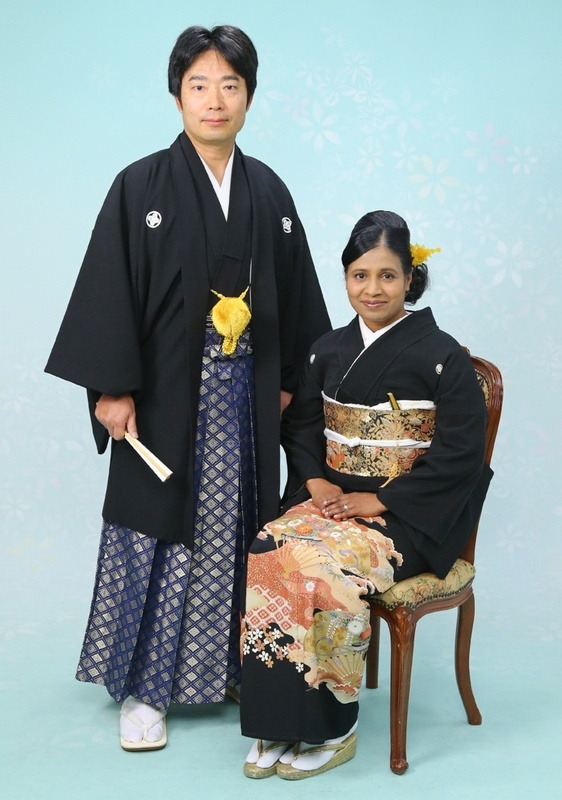 I prayed for good health and prosperity for hubby and me. Afterwards we just walked around inside the shrine premises. We were surprised to see an old sword exhibited in the shrine precinct, which is probably a samurai sword although we are not sure about it. 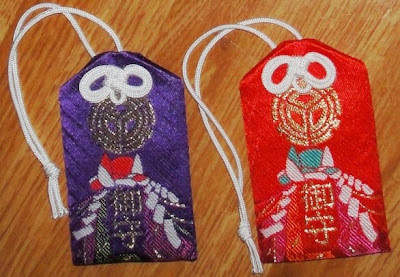 Later we went to an adjacent room in goshaden building and bought various kinds of omamori amulets for good health and driving safety. 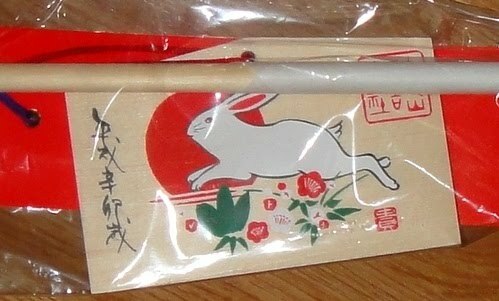 We also bought an eto-hamaya, which is a decorative arrow and has ema plaque with this year’s zodiac animal ‘rabbit’ drawn on it. 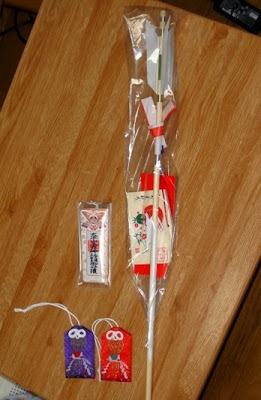 Hamaya decorative arrow is supposed to destroy evil spirits, ward off misfortune, and attract good luck. Hamaya can be purchased at any shrine during the New Year’s time. 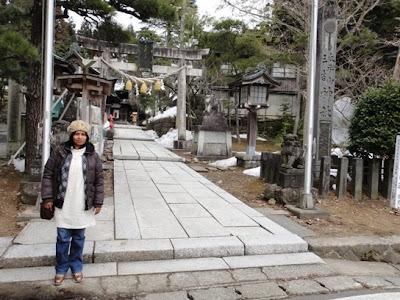 We felt very peaceful after visiting the shrine. 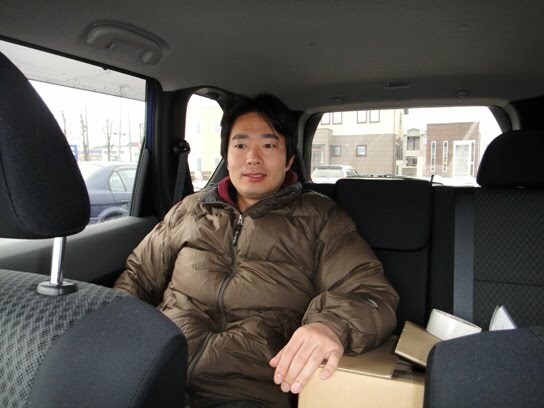 Later hubby enjoyed watching some sports channel on our car television. Thanks Deguide for your comment. 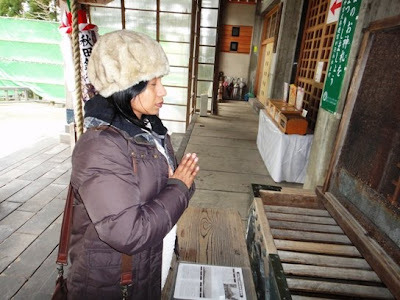 It was very peaceful inside the shrine.